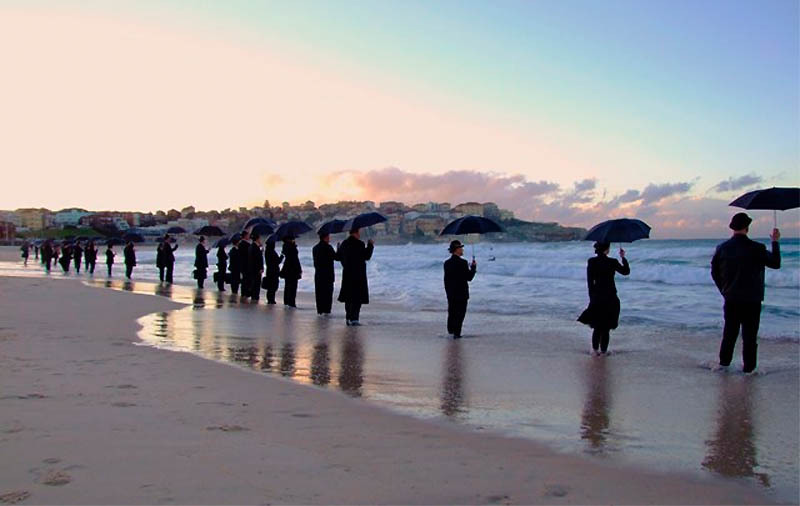 Bowler Hats at Bondi Beach! 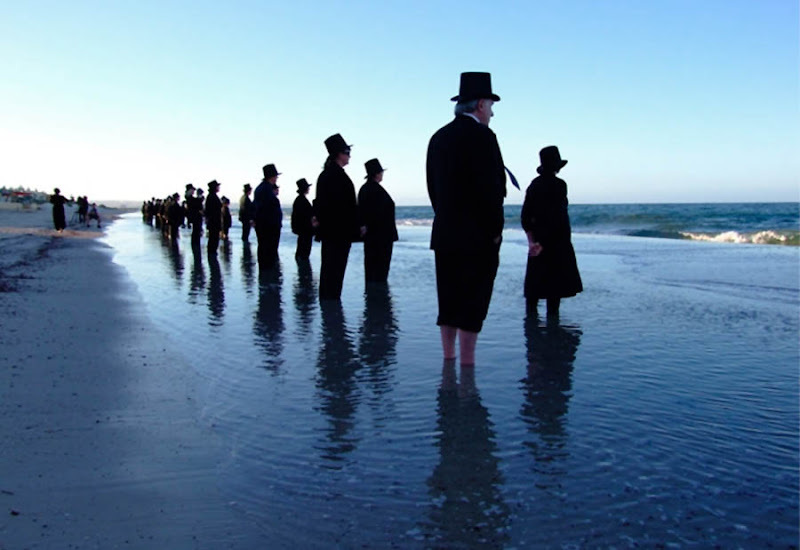 More than fifty dressed up gentlemen come to the waves in the soft light of the dawn. 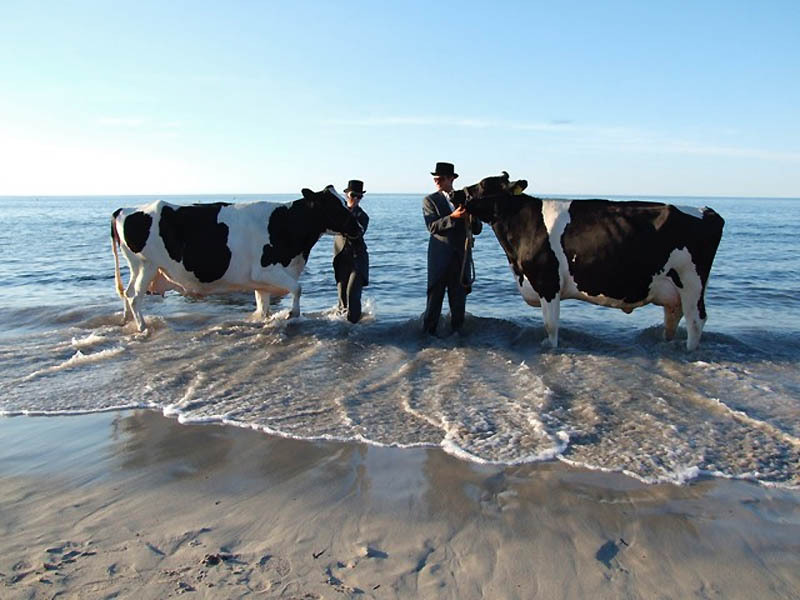 Here is how Andrew Baines describes his process: "Initially, via adverts asking for volunteers in the local media, I set up photo shoots at beachside locations. 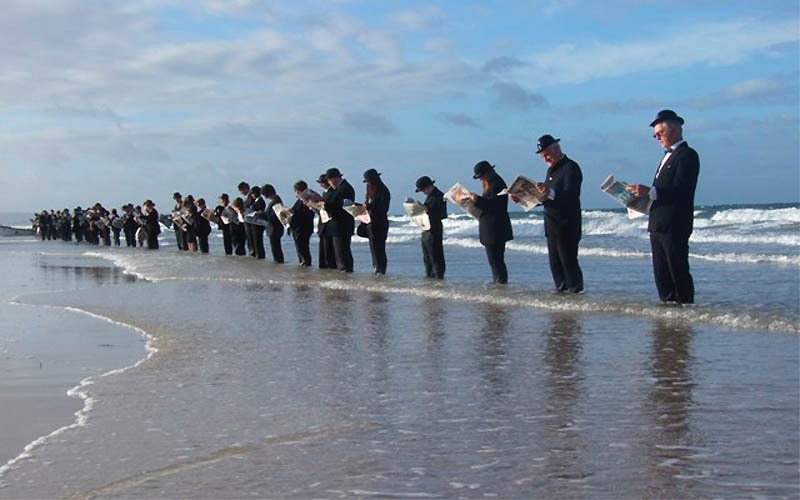 My trademark concept is putting dozens, sometimes hundreds of suited, bowler hat wearing volunteers in the sea at dawn. From these events I film and photograph the imagery for reference for my paintings. I then use a montage of the images to create paintings that convey my concepts. Below I’ve tried to give you an idea how my art highlights social and political issues via some recent installations". 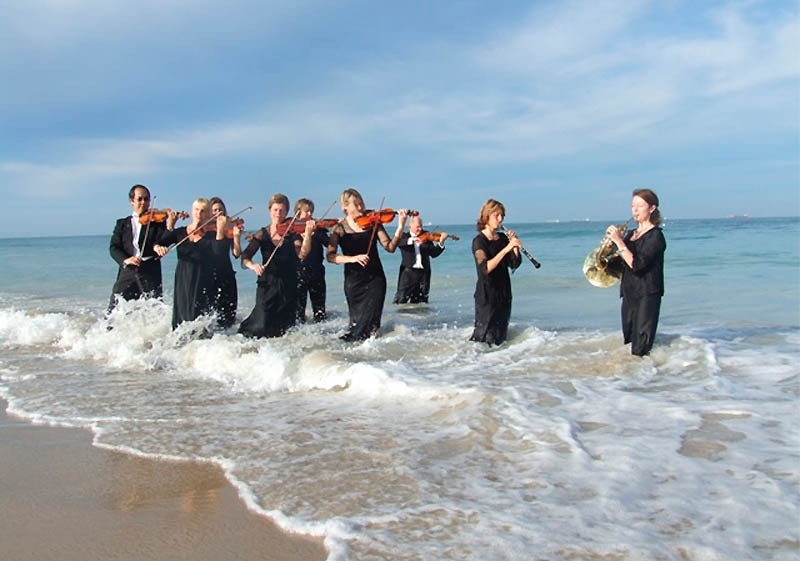 "...I lined up 60 suited volunteers in the Bondi beach surf at dawn, including Liberal leader Malcolm Turnbull, entitled "Escape of the corporate Battery Hen" It was my way of metaphorically letting business people escape from their cramped office pools, long staff hours and grey city streets to enjoy nature, nature in this case being Bondi beach! it dealt with the topical issue of work/life balance." Keep that dog away from my face! 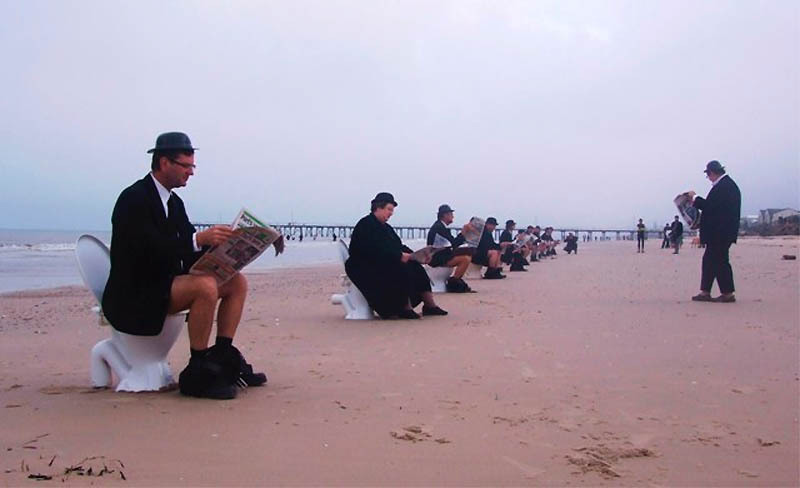 Andrew comments: "A couple of weekends back I created my most quirky and first guerrilla installation, by lining up 12 toilets along an Australian beach with suited volunteers sitting down reading papers, including Liberal Minister Amanda Vanstone, entitled "Coalition Of the Constipated" it highlighted the lack of toilets on the beach front for an eatery precinct. I suppose you would call this a grass root political issue. POWER TO THE POTTY PEOPLE!" "I’ve been a fulltime painter for 13 years, prior to this I had my own micro commercial art business... 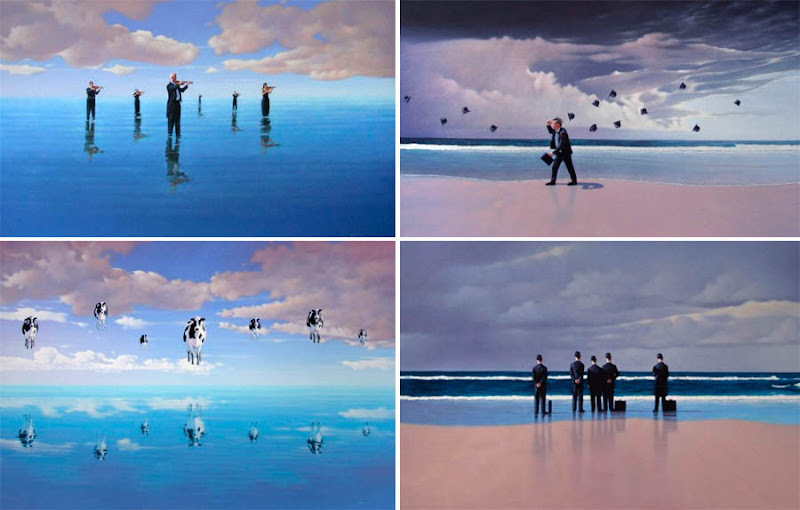 Recently the ANZ Bank in Singapore purchased three of my large surreal paintings and I have been included in a European encyclopedia of surrealist art "Lexikon Der Surrealisten" I’ve been a finalist in many art prizes including twice in the Doug Moran National portrait prize." "The potentially my most recent exciting news, is over the next month or so, over half a million Wirra Wirra Winery wine bottles with one of my surreal paintings on the label and my name on the back will be distributed across Australia and internationally". 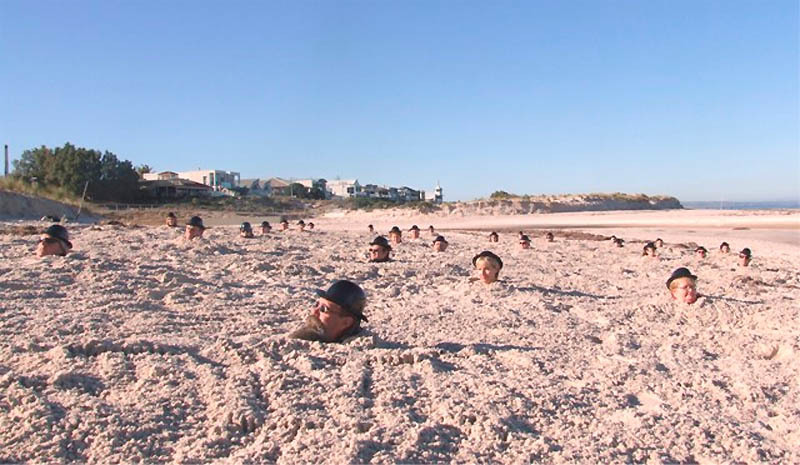 We have to say, this sort of surrealism really speaks to us... see other examples at Andrew Baines siteand also check out our Surreal Art Updates. 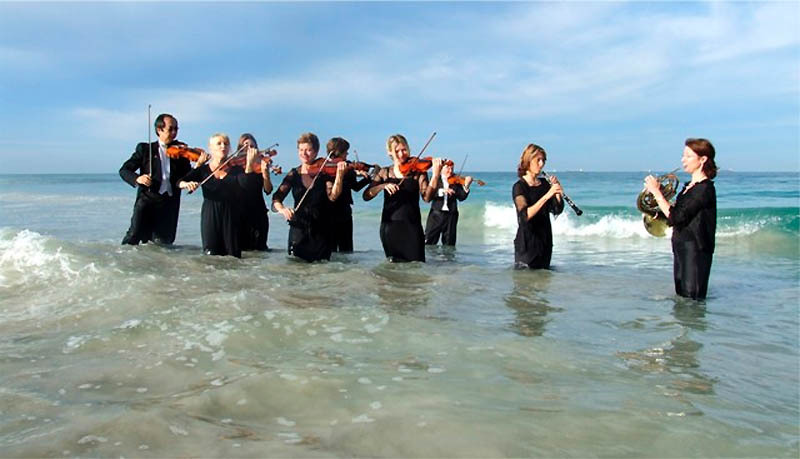 Listening to music like this must be wonderful, but perhaps the musicians would be tempted to play in a faster tempo, depending on how cold the breeze and the water are. 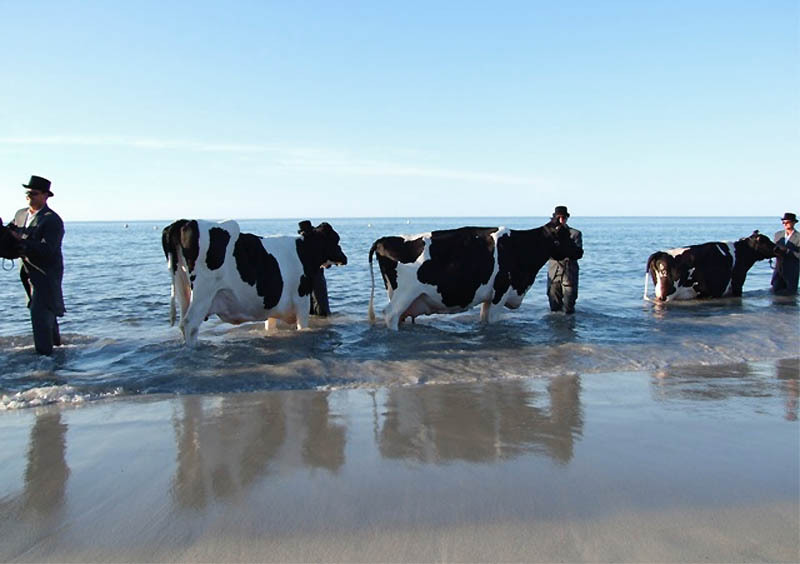 "Last year, I put a herd of Friesian cows in the Indian ocean in Western Australia, as the opening to an international dairy conference, with considerable assistance from the Dairy industry! This was more about aesthetics yet subtly compared the corporate battery hen to the rural battery hen, also both groups are black and white in attire..."
Speaking about his more eclectic installations, Andrew says "Last year, I covered Bondi Beach in Sydney with Hills Hoists clothes lines, complete with local mothers hanging out their washing, entitled "Post Modern Landscape" it was my way of highlighting the demise of the backyard due to high density living." 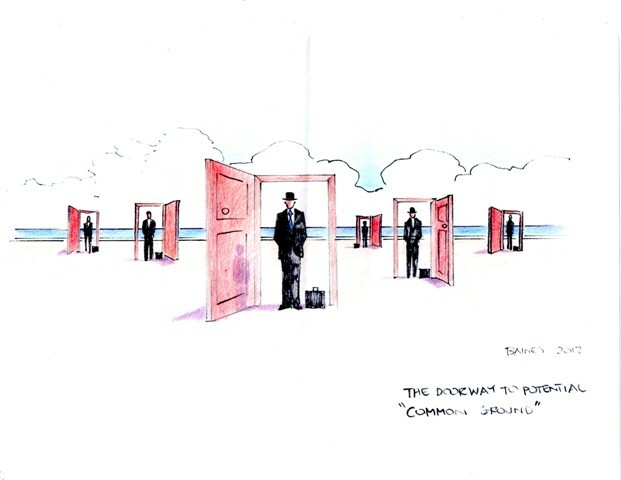 There is also another idea in the making - building doorways and portals with same gentlemanly "office workers" inside (called "Doorways to Potential") - stay tuned for updates! Andrew adds about upcoming projects: "Next, on January the 20th, I will create my biggest installation to date! I’m putting 500 suited volunteers in the sea at dawn, all be drinking tea!". Stay tuned for updates on artist's site and here on Dark Roasted Blend. No accounting for taste, I reckon. you can definitely see that the artist borrowed heavily from the paintings, but the borrowing is so heavy it shows little creativity. at least the models looked like they were having fun!